Reservations are highly suggested if you plan on staying for dinner. Join us this coming Tuesday, July 31 for a tasting of some new wines. For our next tasting we will be introducing you to the lovely wines from Bardolino. The Bardolino DOC is located between the base of Lake Garda to the west and the hills of Valpolicella to the east. The primary grapes used in production are Corvina, Rondinella , and Molinara. These are the same grapes that are used in making the famous wines of Valpolicella. However the two wines are very different. Bardolino is a softer more finesse wine than its fuller bodied cousin. I had the pleasure of meeting Matilde Poggi a few months ago and tasted four of her wines. The wines are perfect these hot Summer days. Her grapes are all estate grown organically and fermented into stainless steel tanks. 100% Garganega grapes Garganega grapes are used in the production of the white wine Suave, which some of you may have heard of. The wine is fresh white with hints of white peach, herbs , and almonds. Blend of Corvina and Rondinella A pale rose wine with subtle notes of strawberry. Great pairing with any delicate fish. 80 %Corvina and 20%Rondinella Cherries, blueberries, spices of cinnamon and black pepper. 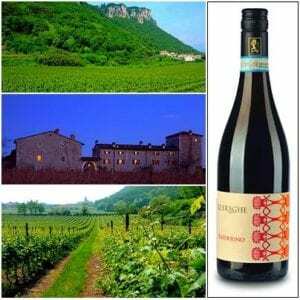 80% Corvina 20% Rondinella This single vineyard consist of 15 year old vines. The grapes are macerated separately and placed for 8 months in wooden vats after fermentation. Ruby red color, wild berries, red currants and balsamic notes. All these wines are excellent for Summer and perfect for lighter meals.